Those seeking exceptional accommodation in Rajasthan will find themselves spoiled for choice. 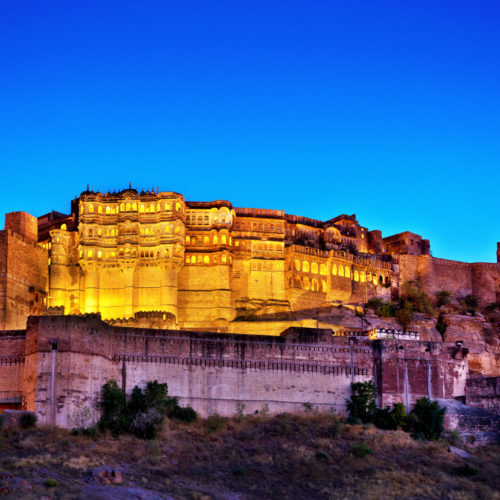 With its array of regal palaces, centuries-old forts, and historic havelis—all of which have been lovingly, and luxuriously, restored—the Land of Kings offers hospitality of a truly royal pedigree. From buzzing cities like Udaipur and Jaipur to the outer fringes of the Thar Desert, we’ve nominated 10 of the best luxury hotels in Rajasthan, all of which are destination-worthy in their own right. The jewel of Udaipur, the Taj Lake Palace is both a hotel and one of the Venice of the East’s most iconic attractions. That’s thanks to its splendid white marble façade, its regal past, and the fact that it sits poised in the middle of Lake Pichola. Upon arrival, guests are ferried by private boat to the island-bound hotel, where they’re welcomed amidst a shower of rose petals and with a flute of bubbly. 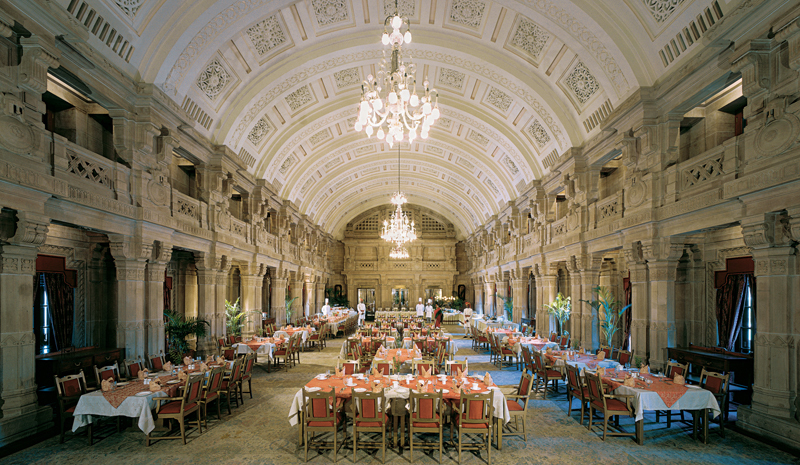 The Umaid Bhawan Palace ranks amongst the world’s largest private residences (and, to this day, still houses members of the local royal family in one of its sprawling wings). It also offers acres of manicured gardens, proximity to landmarks like the Mehrangarh Fort, and absolute pampering at the Jiva Grande Spa. No wonder that, for visitors to India—including numerous celebrities and A-listers—it’s considered one of the very best luxury hotels in Rajasthan. 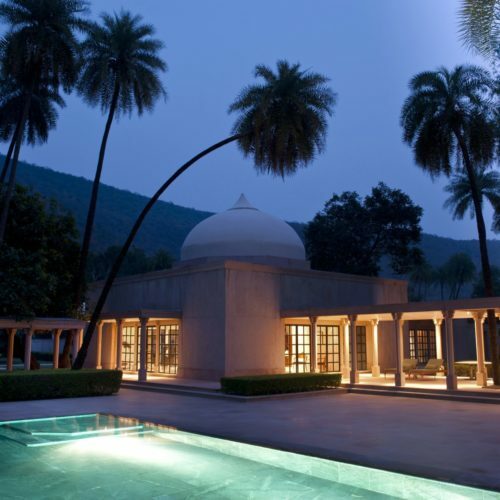 Though Raas Devigarh is housed in an 18th-century palace in the Aravalli Hills, the boutique hotel adeptly mingles heritage with an impressive, contemporary feel. Its splendid suites blend minimalist design with pops of color, while landscaped gardens are testament to the landmark’s past glory. 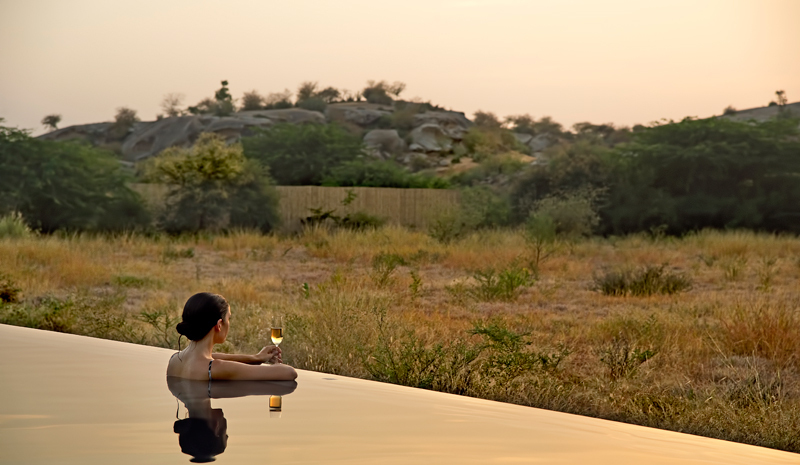 Tented accommodation doesn’t get more sumptuous than what’s offered at SUJÁN’s JAWAI Leopard Camp. With unfettered access to rural Rajasthan’s incredible landscape—which is indeed home to leopards and other exotic wildlife—guests stay in luxury tents outfitted with dreamy beds, en suite bathrooms, and other creature comforts. Initially built as a private palace over 250 years ago, SUJÁN’s exquisite Rajmahal Palace is as much an essential Jaipur landmark as it is a destination-worthy hotel. Recently restored with help from designer Adil Ahmad, the structure’s original features (including a marble staircase and glittering chandeliers) have been complemented by bold patterning, rich prints and exceptionally luxurious amenities. 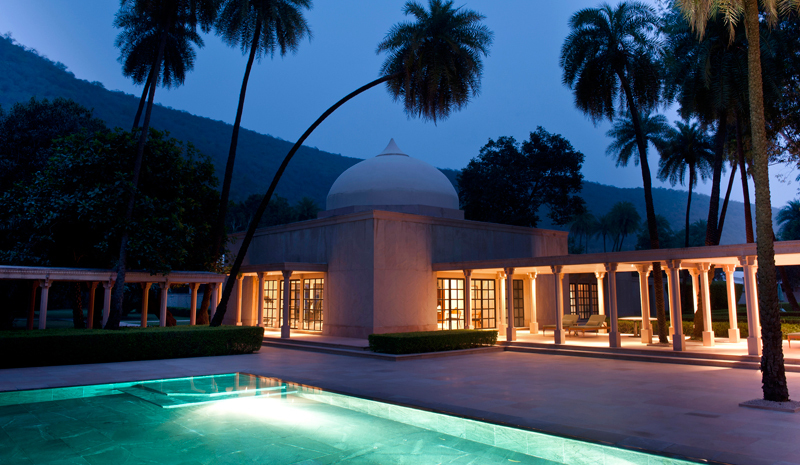 Escape into nature with Amanbagh—one of the best luxury hotels in Rajasthan, and the perfect pampering retreat. Options for Ayurvedic treatments, yoga classes, meditation sessions, and other wellness-focused activities abound. 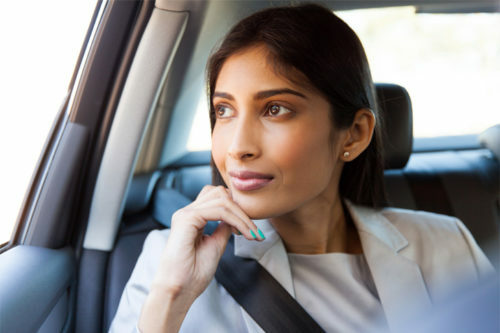 And when you want to venture off the hotel grounds, Sariska National Park, the scenery of the Aravalli Hills, and the picturesque ruins of the Ajabgarh Fort await. What makes Chhatra Sagar a standout amongst Rajasthan’s crop of five-star beauties? Its location is certainly special. Comprised of high-end, en-suite tents which overlook a century-old dam, the hotel gives guests the chance to wake up to views of the water and glorious birdsong. 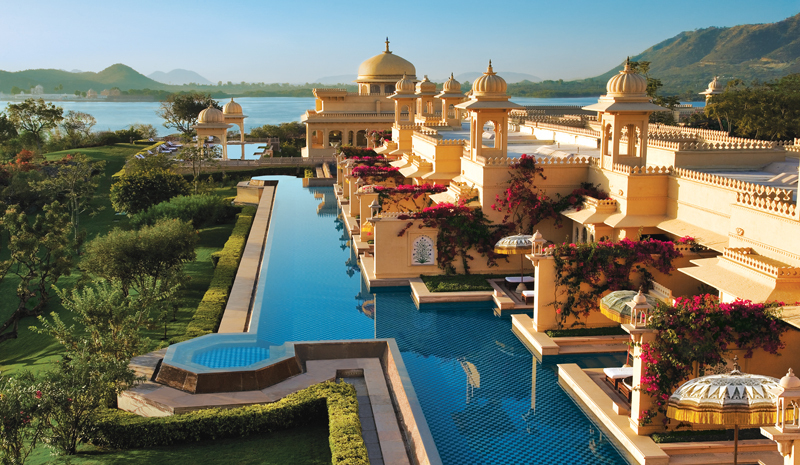 There are few more romantic retreats than the Oberoi Udaivilas, located on the edge of Lake Pichola in Udaipur. Situated on what were once royal hunting grounds, the stunning hotel today has over 50 acres of land (which includes a wildlife retreat). A restorative spa session, a sunset boat tour of the city, and private yoga classes number amongst its many draws. 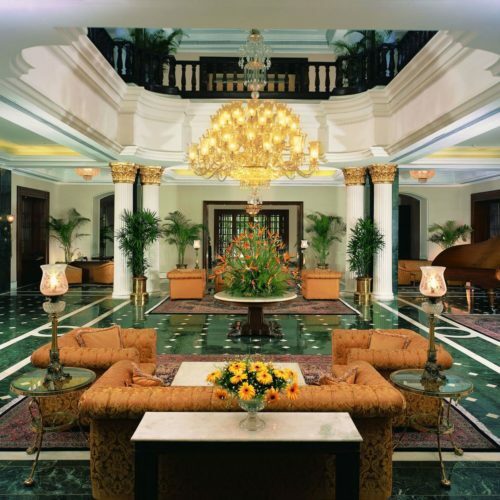 Infused with Rajput design and a wealth of heritage features, Jaipur’s Rambagh Palace was built for the local Maharajah before being transformed into a hotel. Still, the royal welcome persists: guests are greeted by decorated camels, horses, and elephants; can dine in a lounge bar outfitted in a historic steam engine; and go for a guided walk through the historic grounds. 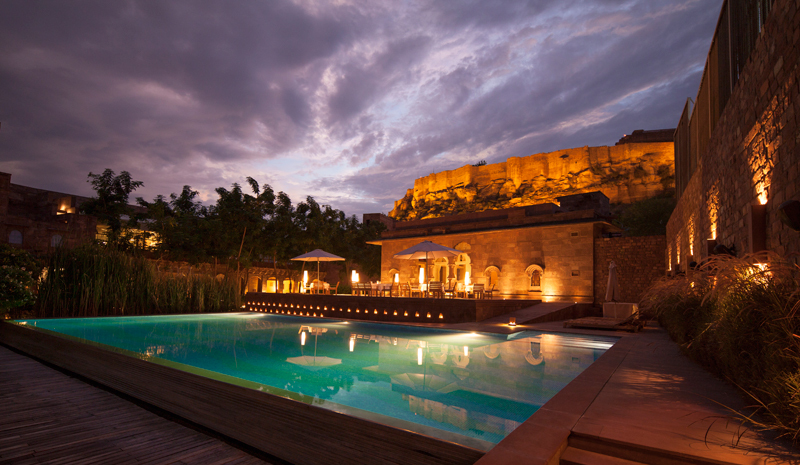 For travelers to the Blue City, few other hotels can compete with the stylish Raas Jodhpur. For one, it makes sightseeing a breeze: its rooftop terrace offers up some of the city’s most impressive views of the Mehrangarh Fort. Housed in a restored, 18th-century haveli, the boutique stay—with its flair for design, heated outdoor pool, and Ila spa—is a wonder.